Someone after my own heart! I'm glad I found your blog! BTW, I didn't know trolleys had days. I know you'll never be lacking for material. My favorite apostrophe error is the apostrophe in the present tense verb. Ouch! Thanks for your comment, Marie! Let me know if you find any examples of your favorite apostrophe error. I'm pretty sure I need to go on the Super Duck Excursion. WOW! What do those super ducks do???? They are amphibious vehicles that take people on tours around Boston and then go into the Charles River or the harbor. It's pretty cool. 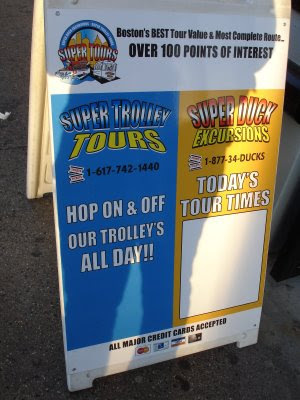 I've been on the traditional Duck Tour, but not the Super Duck. You might as well stop begging Boston to stop making itself look bad. You've proved that illiteracy is running rampant in Boston and there's no end to it.